Virtual Family Office | DKE, Inc.
Today, the Virtual Family Office (VFO) model, developed in the 1990s, enables individual professionals and boutique firms to combine their expertise to serve the ultra-wealthy family in an efficient and highly effective manner. 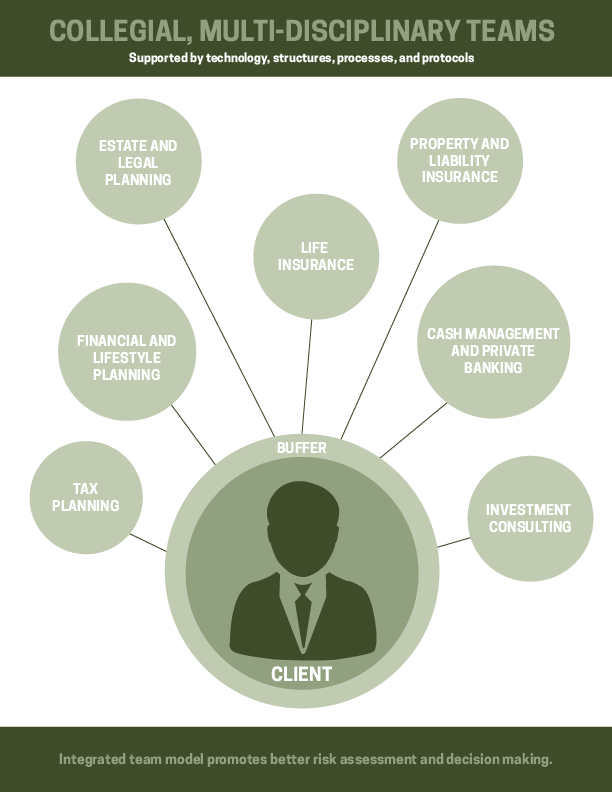 In the VFO model, teams of professionals are assembled to specifically meet the needs of a family such as yours. Your family's most trusted advisor serves as the relationship manager and helps assemble a highly talented and experienced team. The team members train together to ensure they fully understand your family's needs and goals and the responsibilities of each team member. In the VFO mode of operation families pay only for the services they need. Most people believe wealth only consists of Financial Capital and unintentionally ignore other forms of Family Capital which harbor the greatest potential. 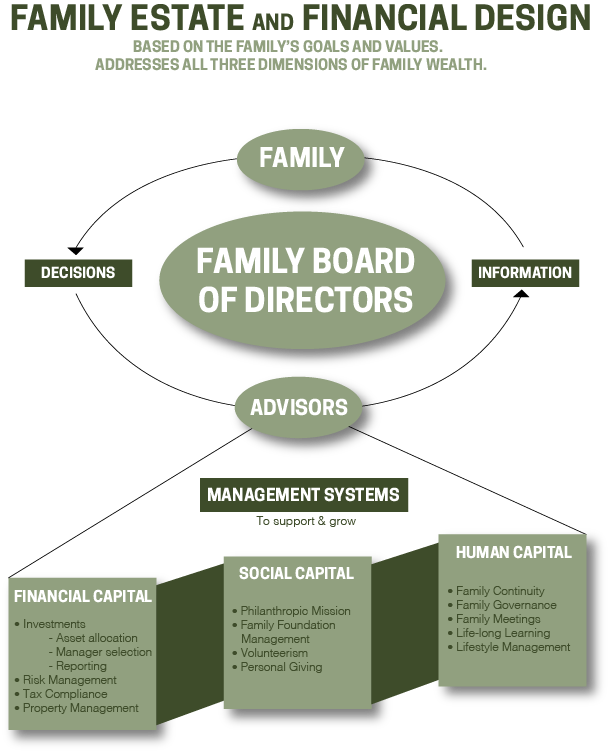 Highly successful families organize their Financial Capital so they are able to devote their resources to cultivating their Social and Human capital. Only when these forms of capital are nurtured can a family build a lasting legacy for generations. Families who commit to being transformational families, believe the most important investments are those in their future generations and their community. 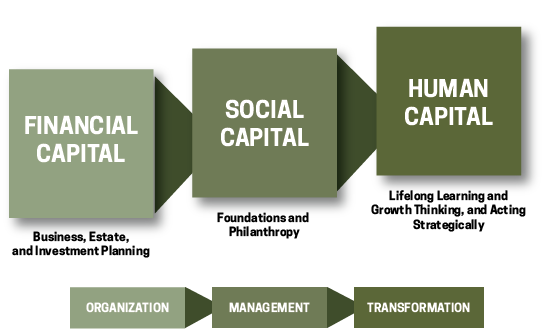 By rethinking the role of their Financial Capital, they begin to see them as a means to support and grow the other forms of their family capital which have the greatest impact on family longevity: Social Capital and Human Capital. Tradionally families build a network of professionals to support them as needs arise. This structure presents potential dangers to a family as recommendations may be made in a vacuum and ignore other areas of planning, or it may rely on the family to relay messages from one professional to another. In this situation, highly technical solutions may inadvertantly be miscommunicated. By using a team structure that fosters communication among team members, planning will become more coorditated, efficient, and cost-effective.